This covers many aspects of the middle ages beginning with an explanation of Viking and Saxon tactics and why knights overcame them, rendering such armies obsolete. Weapons and armour and their evolution are shown and explained. Students are put in both mail and plate armor with their respective advantages and disadvantages explained and demonstrated. 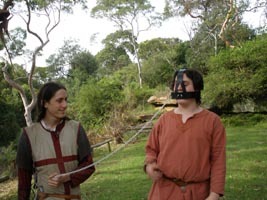 Law and order as well as torture methods are discussed with the use of a pillory being demonstrated. Executions and hangings are also mentioned (mock-hanging a student by way of demonstration is optional). 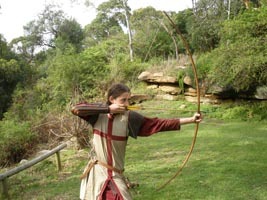 Longbows, crossbows and guns are compared, with the first being demonstrated (note I do not have a gun or crossbow in the show). 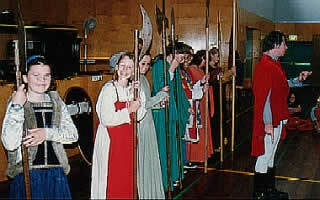 Polearms and Pikes are then mentioned and how these, along with guns, ended the era of knights. The show runs for about 2 hours though this is flexible. I require half an hour to set up and to pack up. Indoor venues are much preferred but not essential and no sound system is required. The Medieval show may also be performed in conjunction with the Ancient show & Viking show in whatever combination is desirable. All students are allowed to look at and handle most of my equipment during a half time break and all students participating in the various demonstrations must be volunteers. Cost is $7 per head per show, plus GST (which is redeemable). Special rates for large groups and extra options can be negotiated. Preferred audience size is 40 to 150 students. Students under age 8 are not preferred.